Barry Thom has been selected as the new regional administrator for NOAA Fisheries, the agency announced Sept. 6. The current administrator, Will Stelle, will transition to a senior advisor position with NOAA Administrator Kathryn Sullivan. Thom, the new West Coast leader, has been with the agency for 15 years and was most recently the deputy regional administrator. He will continue the agency's work on protecting threatened and endangered species, and managing fisheries programs along the coast of Washington, Oregon and California. Stelle will be developing a five-year water strategy for NOAA Fisheries, and work with Thom on California water and tribal fish issues in Puget Sound. The new assignments are effective Sept. 12. Guy Norman was appointed to the Northwest Power and Conservation Council on Sept. 12 by Washington Gov. Jay Inslee to fill the remaining four months of Phil Rockefeller's term. Rockefeller resigned in July. Norman retired in July as regional director of the Washington Department of Fish and Wildlife. His 38-year career included managing Columbia River fisheries for Washington and for Oregon. 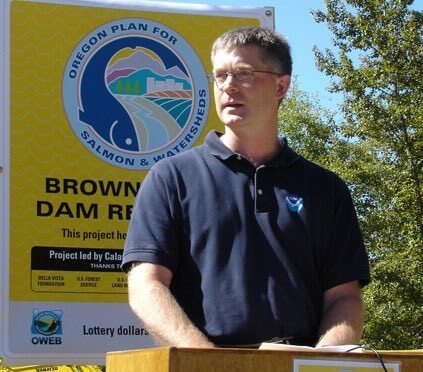 He also served both states in the Columbia River Compact process, and was Washington's lead negotiator with the treaty tribes in developing the Columbia River Fish Management Plan. Wendy Wilson has been appointed executive director of the Snake River Alliance, the group's board of directors announced Sept. 19. Previously, Wilson founded Idaho Rivers United and served as its executive director, and most recently held the top management position with the Idaho-based Alliance for the West. The Snake River Alliance describes itself as a clean-energy advocate and Idaho's nuclear watchdog.